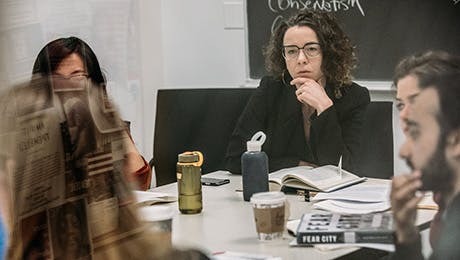 Alice Crary is a moral philosopher in the Philosophy Department at the New School for Social Research. She is the author of Inside Ethics: On the Demands of Moral Thought (Harvard, 2016), a monograph on the representation of animals and humans in ethical discourse which has been described as “a sweeping challenge to several widely shared orthodoxies in metaphysics and moral philosophy.” She has written widely on issues in metaethics, moral psychology and normative ethics, philosophy and literature, animals and ethics, philosophy and cognitive disability, and philosophy and feminism, as well as on figures such as Austin, Cavell, Diamond, Foot, Murdoch and Wittgenstein. Crary is also known for Beyond Moral Judgment (Harvard, 2007), which challenges received images of the nature and difficulty of moral thought by bringing out the moral dimension of all language. While finishing her doctorate in philosophy at the University of Pittsburgh, she co-edited and wrote the introduction to The New Wittgenstein (Routledge, 2000), which continues to influence debates over Wittgenstein's philosophy. Crary is the co-organizer of Social Visibility, an interdisciplinary workshop on critique and social justice happening April 12-13, 2019 at Vanderbilt University. She is also a member of a number of international research groups devoted to subjects such as ordinary language philosophy, the rational aspirations of social criticism and feminism and philosophy. Crary is a former Chair of Philosophy at the New School for Social Research and Founding Co-Director of the Graduate Certificate in Gender and Sexuality Studies. A recent interview regarding her work and views is available here. Radical Animal (projected completion summer 2019). "Objectivity," in James Conant and Sebastian Greves, Wittgenstein: Basic Concepts, Cambridge University Press, 2019. "Cavell and Critique," Coversations, issue 6, winter 2019. Co-authored with Joel de Lara, "Who's Afraid of Ordinary Language Philosophy? A Plea for Reviving a Wrongly Reviled Tradition," introduction to a special issue of the Graduate Faculty Philosophy Journal, spring 2019. "Response to Avner Baz," "Response to Nora Hämäläinen," "Response to Anne-Marie Christensen-Sondergaard," "Response to Aaron Klink," and "Thoughts on Cats and Theology: Response to Stanley Hauerwas," posted as part of a book symposium on Inside Ethics at The Syndicate, https://syndicate.network/, September 3, 2018. "Putnam and Propaganda," Graduate Faculty Philosophy Journal, vol.38, no.2, Fall 2017, pp. 385-398. "The Horrific History of Comparisons Between Animals and Cognitively Disabled Human Beings (and How to Move Past It)" in Lori Gruen and Fiona Probyn Rapsey, eds., Animaladies, Bloomsbury, 2018. "Wittgenstein Goes to Frankfurt (and Finds Something Useful to Say)" in Nordic Wittgenstein Review, June 2018 (An expanded version of this article appears in Richard Amesbury, Hartmut von Sass and Christoph Ammann, eds. Doing Ethics with Wittgenstein, Bloomsbury, 2019). "Cognitive Disability and Moral Status," in Adam Cureton and David Wasserman, eds., Oxford Handbook of Philosophy and Disability, Oxford University Press, 2018. "Ethics," in Lori Gruen, ed., Critical Terms in Animal Studies, University of Chicago Press, 2018. "Coetzee's Quest for Reality," in Patrick Hayes and Jan Wilm, eds., Coetzee and Philosophy, Oxford University Press, 2017. "Feminist Thought and Rational Authority: Getting Things in Perspective," New Literary History, vol.46, no.2, 2015. "A Radical Perfectionist: Revisiting Cavell in the Light of Kant," Journal of Aesthetic Education, vol.48, no.3, 2014. “Freedom is for the Dogs,” in Martin G. Weiss and Hajo Greif, eds., Ethics – Society – Politics, De Gruyter, 2013. "Imagination and Advocacy," in The Point, issue 6, Winter 2013. “W.G. Sebald and the Ethics of Narrative,” Constellations, Spring 2012. “Dogs and Concepts,” Philosophy, April 2012. “Minding What Already Matters: A Critique of Moral Individualism,” Philosophical Topics, Spring 2011. “A Brilliant Perspective: Diamondian Ethics,” Philosophical Investigations, October 2011.